The selection of party games on the PS4 has been steadily growing, and it has made for some great get-togethers at my place. Whether it's trivia, cooperative gaming, or competitive matches, there's plenty to choose from. Despite this wide selection, not all party games are created equal. For a game to truly stand out, it needs to be unique and captivating. Otherwise, the group will most likely vote to move on to something else. Enter Ultimate Chicken Horse, a new party game for the PS4. With a combination of level building and platforming, it's certainly unique, but does it beat out the other party games vying for your attention? Let's find out! Beyond a unique name, Ultimate Chicken Horse also has a premise to match. You and up to three other players work together to place objects and traps into various levels before then racing through them to see who can get to the end first. Between each round, you'll have an opportunity to place new items into the fray, or the occasional bomb if you wish to blow up a nefarious trap that another player placed. As you continue to play, new content is unlocked to expand your options. It’s a simple, but effective combination of gameplay mechanics that gives everyone a chance to turn the tide with a smart placement or by destroying another player’s strategy. The game also includes a variety of modes that range from creative to competitive. Support for up to four players locally, and a shared controller option ensures that anyone can get people together for a round of Ultimate Chicken Horse. Let’s find out if this premise translates into a great party game. The careful strategy of item placement and level building is a stark contrast to the chaos of players racing through the level to reach the end in one piece. At the end of each round, the game calculates the scores based on a variety of factors. Making it to the end first will give you a point boost, of course. You’ll also get points for any coins you collected along the way. In addition, points are awarded for any traps you placed that managed to get a player during that round. The standard mode used for my group of players was Party Mode, which involves selecting from a randomly chosen set of items and then racing through the level together. The creative mode offers the option to open an inventory and select your item to place before the timer runs out. Challenge mode provides leaderboards for completion times across custom levels that are saved online. Finally, the Free Play mode gives you the chance to create custom levels to save, upload, and use later. This mode is non-competitive but allows you to flex your creative muscles. When you consider all of the modes and the variety of levels, Ultimate Chicken Horse has far more content to offer than your average party game. While there is a shared controller option for the creative mode, I preferred playing online or locally with other players. In a pinch, the shared controller mode works fine, but doesn’t offer the chaos of racing through the level simultaneously. While it is possible to make levels that are nigh impossible to beat, the game provides bombs and dynamite at regular intervals to destroy other player’s traps or obstacles. Furthermore, an option to “give up” during your turn ensures you can move on if the level design is currently unfinishable. The only other issue I had with Ultimate Chicken Horse, was the rate at which new content unlocks. I was able to unlock a new level fairly quickly, but with multiple people playing locally on separate profiles, I had a difficult time triggering new unlocks. I would almost prefer that the game gives you all of the levels up front so you don’t have to work for the variety that represents one of the game’s biggest strengths. Despite my issue with the pace of unlockables, I really enjoyed my time with Ultimate Chicken Horse. In a group of people, the game offers some of the most fun I’ve had with a party platformer. The unique combination of level creation and racing to finish it is unlike anything I’ve experienced with PS4’s lineup of party games. There’s a nice variety to the options as well, with plenty of traps and items to place in the level. Any game that includes the option to place a black hole and a flower that punches players in the same level gets a thumbs-up from me. The animal characters in Ultimate Chicken Horse have great animation and personality. The sheep in particular is a standout character who makes quiet noises of uncertainty or discomfort as you navigate the level. 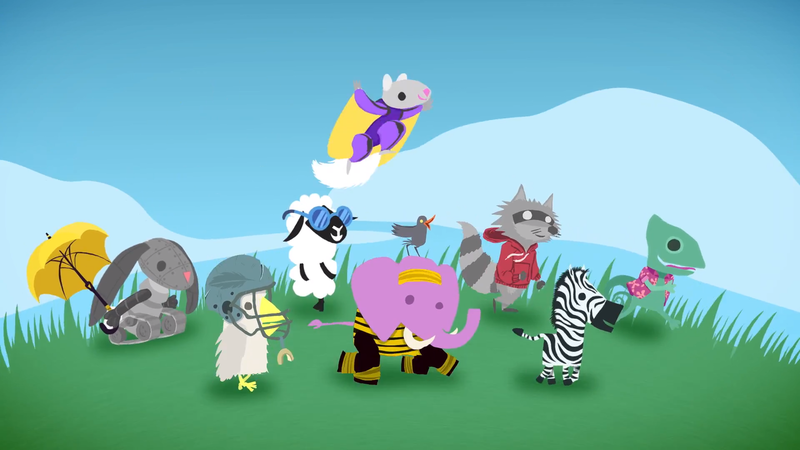 The developers have also added new characters and content since launch for free, including an elephant character. The strong post-launch support thus far bodes well for the game’s long-term replay value. The simple and colorful art style is used to great effect, especially the grid-based placement during level creation. All of this is wrapped in an exquisite soundtrack that combines funky guitar with fast-paced percussion, and a variety of other instruments. Whether it’s the steady rhythm of low brass, or the rhythmic plucking of banjos, Ultimate Chicken Horse has a soundtrack that will keep your head bobbing along with the games infectious pacing. 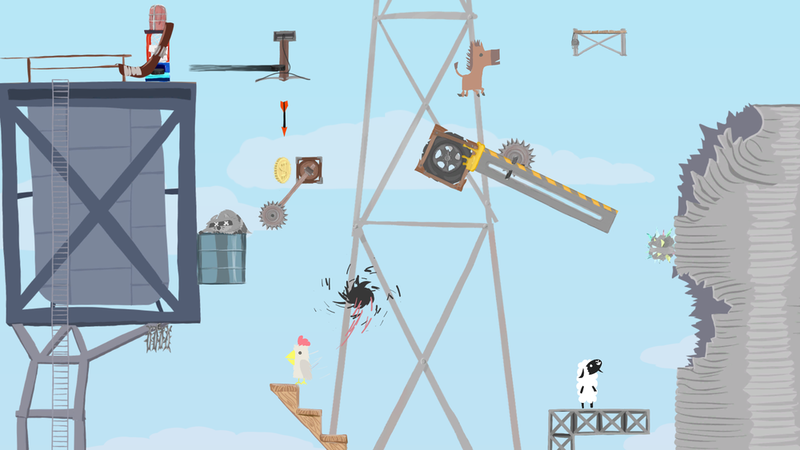 Party games are fairly prevalent on the PS4, but Ultimate Chicken Horse proves that there’s plenty of new ideas still waiting to be brought to life. With a great combination of level creation and competitive strategy, this is my new go-to pick for future gaming get togethers.